Video lesson: How to automatically fill in a web form. Video lesson: How to automate downloading from YouTube. Video lesson: "How to use Replay Branches based on Pixel Control"
Easy automation of free file downloading from share sites like Rapidshare or DepositFiles. AutoClickExtreme Mechanism of Window search. How to use Replay Branches. AutoClickExtreme - getting rid of tears. It's a review of articles, that deal with automated software tests. These articles are written by the specialists, who have wide experience in software testing automation. Example of AutoClickExtreme use for making reliable automated software tests. The new version makes it possible to copy/paste separate actions and to change the number of a Replay Branch. - You can process large amounts of files, make backups, convert data from one format to another, and automate Excel tables. 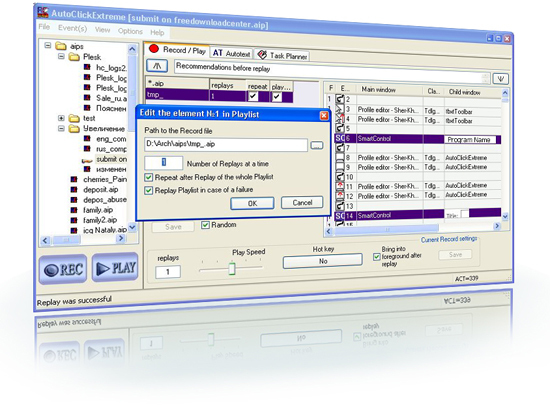 - Use the Playlist for automated software testing. 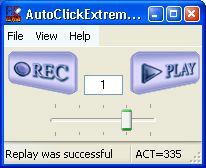 AutoClickExtreme will perform a series of tasks at random or in the order given in the Playlist. It will test other programs itself. It can work the whole night without your help, and you can be sure, all the work will be done properly. - You can edit the recorded actions manually and insert pauses before any actions, moreover, now you can copy and paste any action from one task to another. - This multi-purpose autoclicker can function as a scheduler. You can schedule macros at any time, any day of the week! - With the "autotext" function, you can insert any large text in any Windows program instead of just a few words or characters. - You can set a "hot key" for any task and use it to run the task any time you like. - You can also use the new Pixel Control technology with Replay branches. AutoClickExtreme waits for the needed images to appear on the screen and carries out this or that sequence of actions depending on the image it finds. This smart autoclicker will itself suggest you where to create an alternative Replay Branch. You don't even have to bother about it. - All your programs will be under your control with AutoClickExtreme. Automate Photoshop, Excel, Word, the Internet ... anything! AutoClickExtreme is unique compared to other automation software. It's the most reliable autoclicker in the Internet market. Read about ACE's advantages over its competitors. We provide professional support. All your AutoClickExtreme questions will be answered, and all your suggestions will be taken into consideration. You will get professional advice about your work automation. The free trial period is 41 days, during which time you can use both the simple and the professional view. When the trial time expires, you can still use the simple view of the program. Download AutoClickExtreme free of charge. AutoClickExtreme is a multi-purpose universal autoclicker. It will save you time and energy by automating all your routine computer tasks. You will do only the creative part, and the rest will be done by AutoClickExtreme. The registered version costs only $49.